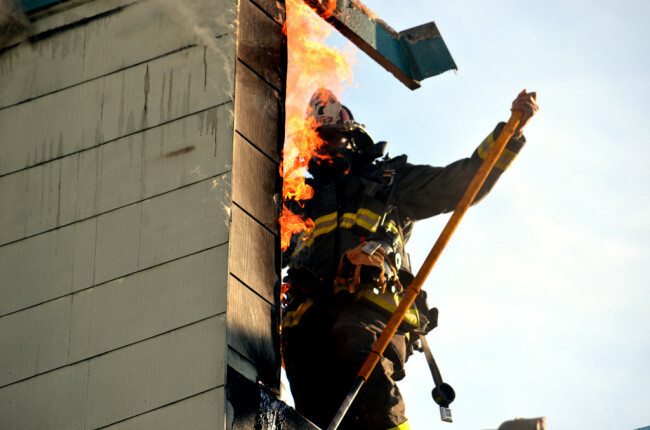 A fire broke out sometime around 6:30 p.m. this evening spewing flames and smoke into air in a blaze that looked as if it was isolated to the rooftop of a two story building on the corner of San Carlos and 21st Streets. 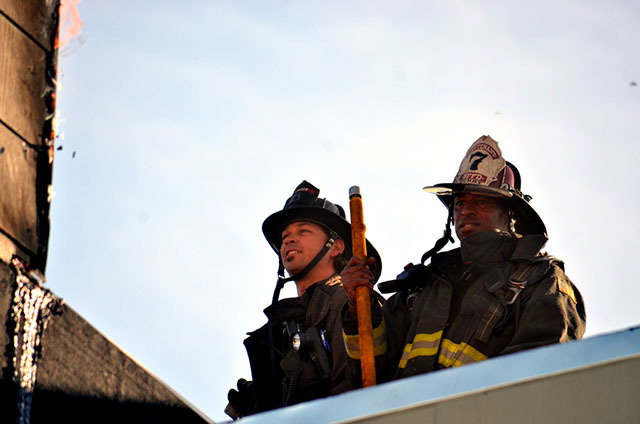 Onlookers gathered to watch as three fire trucks swung onto 21st Street and San Carlos to battle one-alarm fire. By 7 p.m. the blaze had been contained. 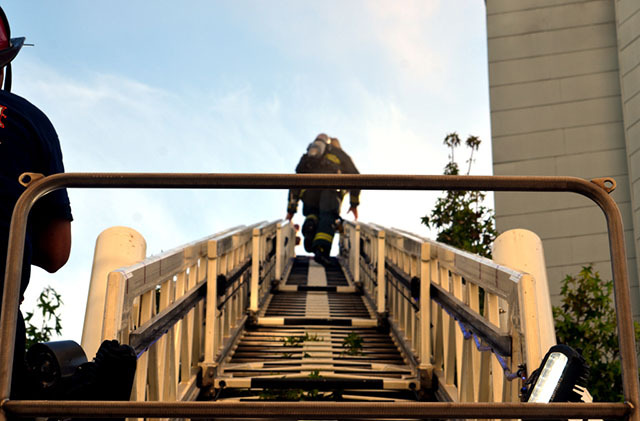 As onlookers watched and listened to the crackling of wood burning, firefighters climbed up the ladder and onto the roof. Firemen knocked down part of the parapet and broke through the roof to extinguish the fire, which had spread from the rooftop to the attic. The building is a five-bedroom home shared by several roommates, according to one resident who declined to give his name. Faze, a clothing maker, is on the ground floor. One of the tenants said he arrived home to see his neighbor outside calling the fire department because of smoke coming from the roof. 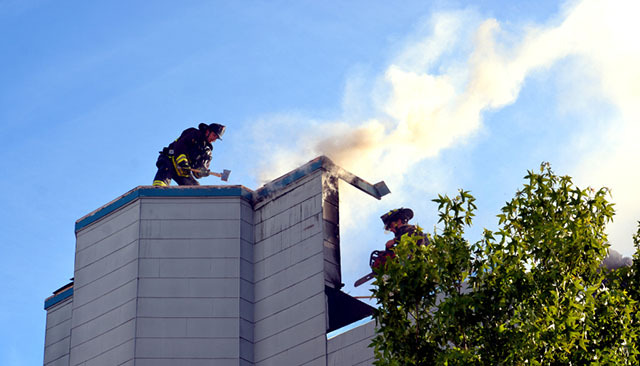 He climbed on the roof to see flames licking the parapet wall on the San Carlos side of the building. Johnny Travis, the co-owner of Faze, said he was alerted by the neighbor who saw smoke coming from the rooftop and immediately went outside to see if he could alert other neighbors or the building’s management company, whose office is next door to Faze. Assistant Chief Tom Siragusa said there was construction being done on the roof, though he couldn’t say for sure if that was the cause of the fire. 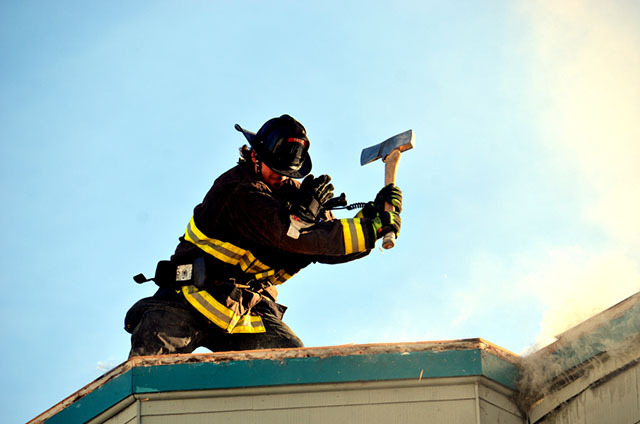 “Sometimes roofers use heat to put down barriers and they need to stick around for awhile to make sure this doesn’t happen,” Siragusa said. He said only one bedroom was substantially damaged. A man who identified himself as the property manager confirmed there was a hole in the roof and that water had poured in from firefighting efforts. One resident said she would not be able to stay in her room tonight, but she planned to stay in the house by sleeping on the couch. The others, it appeared, will be able to return to their spaces this evening.